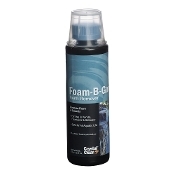 CrystalClear Foam-B-Gone will remove foam from water within seconds of application. Excessive proteins present in pond water usually cause foam. Protein foam can be harmful and should be removed quickly.